My property may show available but please allow me to confirm these dates prior to a reservation request or organizing your flights since your desired dates may create gaps of less than a week on either side of your stay that are difficult to fill.. This is a magnificent property so I do not want to disappoint you if I cannot work with your dates and prior to booking your flights you may have the flexibilty to arrive sooner or leave earlier. 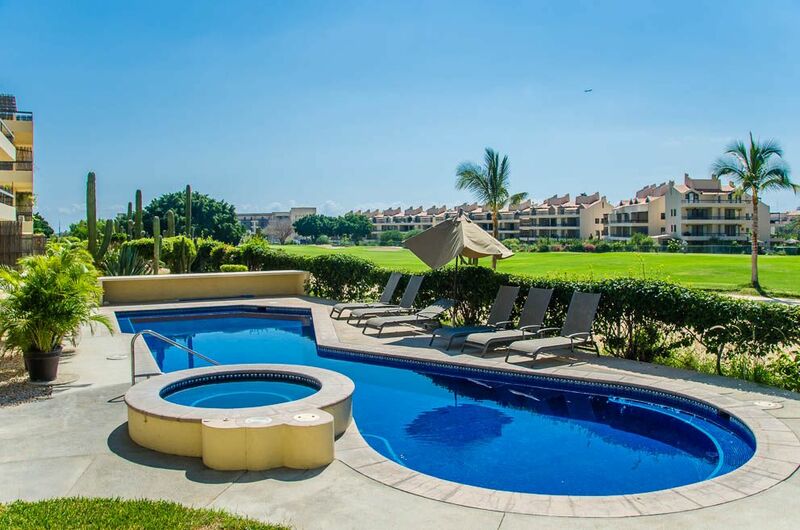 This condo is beautifully situated right in the middle of the San Jose del Cabo golf course, just across the street from a beautiful stretch of white sand beach. This third floor unit can accommodate 2 to 6 people (one bedroom or two), it has an upstairs bedroom (with A/C) with its own bathroom (with a soaker tub - the only one in the complex!). The upstairs bedroom has two twin beds that make into a king if desired. The unit is tastefully decorated in traditional Mexican style but with many modern amenities like a computer including free Wi-Fi.. The complex has three pools, two whirlpools, a pool bar and several palapas for extra shade. San Jose del Cabo is the 'quieter' sister to lively Cabo San Lucas, only a 20-minute drive away. It is a quaint town with many wonderful restaurants and shops. With the Sea of Cortez shining from your balcony with view across the green of the golf course, the waves are close enough to hear pounding on the beach. This is a wonderful place to relax and rejuvenate. We are Canadians that love to travel. Cabo was our first condo but now we have expanded our collection to include Hawaii and Spain. Mexico is a family oriented country and we are family oriented people. I love the language and look forward to conversing in it fluently. Club la Costa is centrally located and just a 15 minute walk to the town of San Jose. Also, there is a costco only 20 minutes away and my first stop when I arrive. The people are friendly and the weather is almost always beautiful. The only tub in the complex. We were very happy with the property, well maintained and nice surroundings, we rented Peggy's car and found that to be very useful as well. The beds were comfortable and the condo had all you needed to enjoy your stay. Lots of Canadians in club la costa so we made some friends as well. Very much enjoyed the property. I loved being close to the main street, so we could walk to restaurants and shops. The kids had fun in the pool, and having the car available was terrific for food shopping/ going to the beach or activities in Cabo San Lucas. Our family of four booked a one week stay at this condo in early August along with a rental car (2001 Xterrra) offered by the owner for an additional $250 for the week. On our first day there, we were at the beach at Playa Palmilla when a mass shooting occurred, eventually killing four people, and injuring one other. We ran from the bullets. We were naturally very shaken up and chose to leave early. The US State Department has since issued a travel advisory due to the increased violence in Los Cabos resulting from that incident. When we contacted the owner, Peggy, she was very insensitive, never once asking about our safety and well-being, or how our kids were doing. Instead, when we asked for a partial refund, on the condo, or at least the car (that we drove a total of 10 miles), she said that because violence happens everywhere, she would not consider any refund whatsoever, even though there was virtually no other guests in the condo complex. For someone who professes to be in the "customer service business," Peggy really needs to work on her people skills. I was very disappointed by the owner's response under these unusual circumstances. Our family has owned vacation rentals and are currently home share hosts with excellent reviews and we would never treat our guests with such callous disregard. At the time of this renters stay I was in Vancouver with a client who was going through radical chemo therapy for stage 3 breast cancer. I was definitely preoccuppied and was also very surprised that, with all the violence in the world, these renters would chose to leave since the town of San Jose was miles away from the shooting. I have never been to Palmilla since our complex is beautiful I have been in cabo since 1998 and found the town of San Jose both safe and accommodating offering everything I needed so venturing to Palmilla was not necessary. I cannot control the weather or violence or many other things that can occur during a holiday. I specifically suggest trip cancellation insurance on page 4 of my rental agreement, which is accepted prior to accepting a reservation, to guard against unforeseen events. I can only make my accommodations the best that I can so the tenant can enjoy their stay in my condo. I checked with 3 hotels and no one was leaving due to these shooting. Also, the hotel across the street, Cabo Azul, was not offering a refund due to the shootings so I was very taken by surprise that these renters would assume that I would offer one when the shootings were not something I could prevent or predict. This complex is very well kept, private, quiet, clean and gated. We enjoyed the solitude at the end of our busy days cruising around the area. This condo is great for families or two couples and has a very well equipped kitchen. We loved the 2 balconies! First of all I would like to thank you for the use of the condo. It was everything you said it was. Kim and I loved just sitting on the decks and watching the sunrise and sunsets. Plus all the birds are a nice addition. We will definitely be calling you to use it again.